The EW5000 adds a dramatic focal point to any outdoor entertaining area, while its large cooking surface allows you to enjoy BBQ cooking the way it was meant to be done. For long life, Escea constructed the firebox of high quality 4mm thick steel. This outdoor barbecue fire needs to be enclosed in non-combustible masonry, stone, concrete or brickwork. Escea can provide a ready-to-build steel frame enclosure (KSE) which can be finished with a suitable fireproof material of your choice. 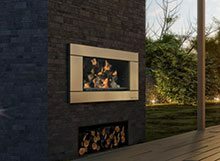 The EW5000 outdoor wood fire can be installed with or without the Stainless Steel Ferro fascia. The fascia-less look gives a more traditional option and can be installed flush or recessed into your non-combustible fire surround. To allow you to enjoy BBQ cooking, the EW5000 features a cooking plate which can be placed at three different heights to regulate heat. When not in use, the plate can be conveniently stored under the ash pan. The easily removable ash tray sits at the bottom of the firebox. If you use a fascia for the EW5000, the tray is totally invisible as is the cooking plate when stored underneath. If you do not have a suitable structure to build your EW5000 outdoor cooking fire into, Escea can provide an easy solution with a ready-to-be-assembled steel frame skeleton and fastenings.